Background of swim: Round Key West Island is a 12.5mile/20km Open Water Swim. It starts and finishes on Smathers Beach on the south-east side of the island. The entry fee is only $150, and if you need a kayker/kayaker it is an additional $150 (if you don’t bring your own person to kayak). This is all spelled out clearly when booking online on http://swimaroundkeywest.com. As marathon swims go, this entry is relatively cheap! The race organiser (Bill Welsien) runs a slick operation. Swimmers got emails the week before we travelled to introduce us to our kayakers, so we could ask them questions and visa versa. This was a great help to get an idea of who they were and their experience of the island etc. Pastor Bill ran everything on time – the briefings, the starts, the prize giving, everything went as per the schedule, he has been doing this race for over 35 years, and has a great team around him keeping the whole operation on the move. This makes life so much easier for the swimmers (90 soloists + 40 relay teams). The swim this year was a few weeks later than normal (28th June), the downside of this was the water and air temperatures. The water registered at 32degC, air at 35degC and the humidity about 80%. This was all alien to us Irish swimmers! We were in new teritory swimming in bath water. We had been warned it could be 28-30degC, but the extra few degrees put us over our limit. Luckily we had arrived a few days before the event to try and aclimatise to the weather and to find supermarkets etc for our water and treats! (Nora may not have arrived on her intended day – but she got there in the end!). Six Irish swimmers entered: me (Carol), Lisa Cummins, Nora Irwin, Roisin Lewis, Riana Parsons, and the only male representing the team, Eoin O’Riordan! We were all coming with various experience to the swim, but we knew that the winter mileage was done and we would just have to do our best to cope with the extreme heat, which none of us had experience of. The day before the swim, we got our last few items in the supermarket, bought cooler bags to keep our drinks cold on the day, mixed up our energy drinks and froze most of them for following day. Thank God for being in apartments with American-sized fridges/freezers – we had LOTS of bottles mixed up! Our plan was to feed every 30mins to start and switch to 20mins (even though we nearly all ended up drinking every 20 to stay hydrated). One last team dinner (carbs of course), first layer of suncream to soak into the skin, and early to bed as check-in was early on Saturday morning. Early alarm call on Saturday, another layer of suncream or first layer of Zinc (depending on choice), we had a breakfast of champions – and it was time to load up gear bags and collect all our bottles to bring to the start. It was a short 5 minute walk to the beach from our apartment. The start is split in two. Wave1, swimmers who want the extra bit of time to make it around the course before tide turns, and to make cut off (8hrs). Wave2 go 30mins later and are the swimmers going for the prizes! Nora, Riana, Roisin and Lisa opted to swim in wave1, Eoin and I opted for wave2. We declared our wave choice at check-in. It was time to meet our kayakers, load their boats with our bottles, pass on any instructions we needed to tell them and apply last layer of suncream/Zinc. 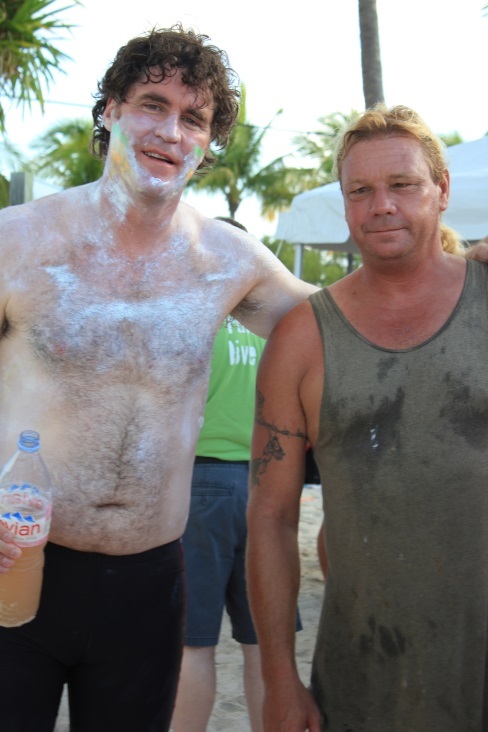 We had two concerns for the swim, dehydration from the excessive heat, and sunburn. It must be said, our kayakers were all great, but VERY different in experience, personality, age etc….it is pot luck who you get. The pic below is of Eoin’s kayaker (Jeffery – he doesn’t do shoes, or watches… but knows his way around the island brilliantly!). 8:30am on the button, Wave1 start, 9:00am wave 2 started. We all found our kayakers within 10mins of starting, and settled into a rhythm. The water was lovely and shallow, there was a little bit of cloud about, all was good so far! We had been told that we get a push from tide between mile 4-5, this co-incided with a lumpy section from boat traffic coming in/out of the main harbour, nothing us Sandycove swimmers couldn’t handle! We then went through a channel at mile 5, which was the first check-point (kayakers shouted our numbers to a person on the bridge above). For the next 2 miles it was like dodge cars, we had to avoid all the boats moored in the bay, this is where I certainly relied on my kayaker – I let her find the best path and I just followed. There was a bit of top chop coming through here, so much so that it pushed my hat off my forehead, but we had been warned, for every bad or lumpy section we get an equal calm bit around a corner! And that was true….turning at the half way point, the chop stopped, water got shallower and clearer – so all was well in the world again. The was plenty to look at underwater as we were swimming along: turtles, stingrays, starfish and general sea life (not as much as I expected, but enough to make you smile when you see them). Heading down towards mile 9 (check-point 2) and we started getting a push again, stronger this time, and shallower, too shallow if you are tall (Eoin had to kick some of it, not deep enough to pull under water!) but this wasn’t for long, only a few hundred metres. At the end of all that fun, we were at mile 10, we just had to swim the last 2.5miles! At this point I was hot, the sun was out in full force, I was working at a decent pace as my kakayer was excited that I was near the front of pack and she was doing her best to keep me going to the finish. I switched my feeds to every 15min on the last hour, I knew I was hot and there was no relief from the air either, turning onto your back meant warmer air and a bright sun, so it was best to keep head down and swim. On the last mile there were 10 wooden stakes along the beach (swimming area), we were told they were 100m apart, so in my head, I tried to swim, 10 x 100s, I was never so relieved to be at no.8! The finish point was now very clear…you can see it from about a mile back, but now it was there, in front of us. I tried to change gear and make an effort to finish strong, but that didn’t happen, there was no next gear in me, the sun had zapped that from me. So I took one last drink and swam to the beach. There waiting were Eoin’s family and Riana’s in-laws, it was lovely to see the Irish flag waving…that was a 4hr41min swim in temperatures that I never want to experience again. On the beach in the tent area, there was water, fresh fruit and a bbq on the go. Once I washed out my mouth (very salty water there), I tucked into some water and food and waited for my swimming friends to finish. Next in was Eoin, his kids ran to the water’s edge to meet him and the rest of us cheered and waved the flag again. Eoin was then found in the tent eating for the next hour! Next home were Lisa and Riana, who ended up meeting in the water about a mile after they started and ended up swimming at same pace for the rest of the swim. Those of you that know Lisa and her love of long swims in cold water, can just imagine her words on the tempetature! Let’s just say Lisa has ruled out a few potential swim ideas in this part of the world. About 30mins later Roisin finished, also muttering somethng about water temp…it was becoming a theme amongst us! We reapplied suncream, kept drinking to stay cool and cheered on Nora as she finished. Nora had a great kayaker, if you meet her ask her about him! 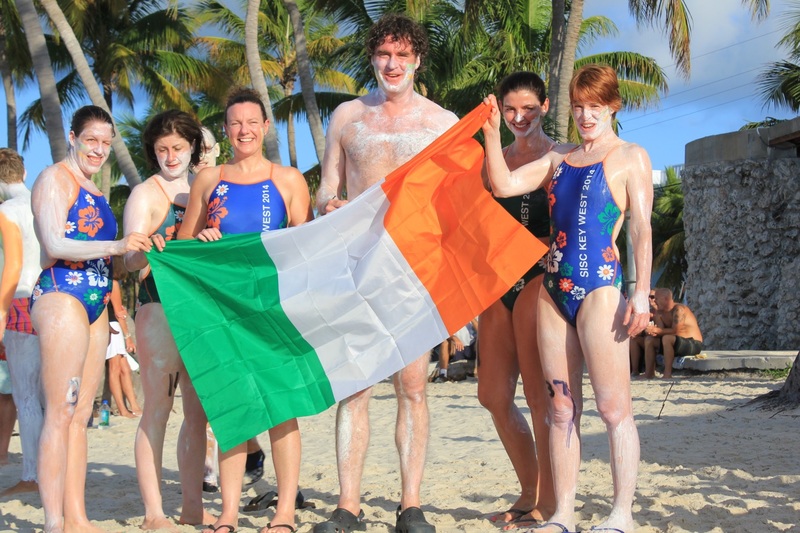 All 6 Cork swimmers made it, despite the heat, we made it around Key West – in style…. The Irish gang in our fancy togs! I think we would all sum up the event the same. Brilliantly organised and on time, super location, but just too warm for us Irish swimmers. It was so draining to swim for that length of time in 32deg water, warmer air and then humidity which we don’t experience often. If this swim moves to an earlier time of the year, then I would say ENTER it now, I would be hesitant to recommend it to swimmers used to colder water if it was on in late June again. We have no regrets, it was a super weekend, and we now all have an upper limit of what we won’t ever swim in again for a marathon swim!